and how many of us still do? This alphabet blog is going far too quickly. At the risk of reverting to last week's theme, it is over the hill now. But I am enjoying it greatly. Wow! I haven't even thought about Quicksilver in years, and I used to love those guys. Thanks for the blast from the past. Still identify? (Raising hand). I love Quicksilver!!! Which reminds me of Ten Years After. Now that's an AWESOME shot . .you are Quick Draw McGraw . . bugger the video that's one helluva photo! 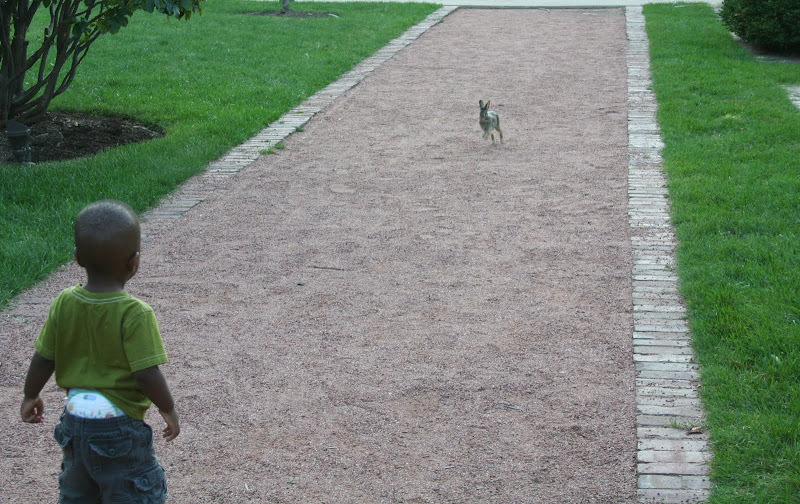 yea, like the pic... is that rabbit going to attack? oh no! Kimy, that may have been a quick snap, but it is priceless. alan - glad to learn you are enjoying the blogabet! I am not looking forward to its end as I like the structure it provides. roy - you are welcome, past blasts can be fun!! tom - we have heard of attack rabbits, but this little fellow veered off when he figured out there were humans ahead! merle - merci, it is one of my favorite pics, those two sweet little beings!! kimy,'tis still a pretty powerful song, given to-day's environment; and ever closer...have't heard that QMS song for some time. Thanks!